Herpes zoster occurs due to reactivation of the latent varicella zoster virus and is usually a disease of adults. Childhood herpes zoster is believed to be rare, though recent studies suggest increasing incidence in children. We report a case of an immunocompetent eleven year old girl with ophtalmic zoster. Shingles is a dermatosis caused by a reactivation of the varicella-zoster virus (VZV) which remains quiescent in the dorsal sensory ganglia after a primary infection with chickenpox.1 The child's shingles are rare and particularly the ophthalmic form, which can be responsible for serious eye complications requiring adequate and early management. 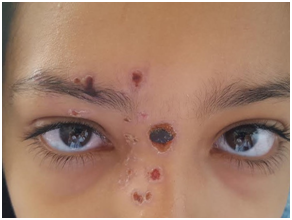 This is an 11year-old girl who was consulted in the emergency room for a right eye pain with edema palpebral evolving for three days and received antibiotic therapy (self-medication) without any improvement, having as antecedent a primary infection with chickenpox 12months old. The clinical examination showed a preserved visual acuity, a vesicular and crustous eruption on the path of the V1 and the V2 (right side of the nose and the right half-forehead), a right eyelid edema (Figure 1), the examination of the anterior segment: superficial punctate keratitis in the lower third of the cornea, the fundus is normal. Figure 1 Grouped crusted erosions of ophthalmic zoster in the right eye. An immunological assessement for immunosuppression was negative (serology of a retroviral infection). The patient received antibiotic treatment, oral antiviral (aciclovir), local antibiotic therapy and wetting agents. The evolution was marked by the regression of the palpebral edema and the disappearance of cutaneous and ophthalmological signs (Figure 2). Figure 2 Regression of cutaneous signs. 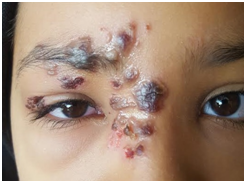 The Feature of our case report is the occurrence of shingles in an immunocompetent child, and the ophthalmic localization, which remains a rare form in children, but with a favorable evolution. Lethel V. Mancini le zona de l’enfant. Journal Pédiatrique de Puéricultures. 2002;15(3):131‒136. Nigam P, Kumar A, Kapoor KK, et al. Clinical profile of herpes ophtalmicus. J Indian Med Assoc. 1991;89(5):117‒119. Gargouri L. Le zona ophtalmique à propos d'un cas chez un garçon de 13 ans. Journées de dermatopédiatrie 2010 à Tunisie. Infections à herpès virus de l'enfant et de l'adulte immunocompétents. varicelle et zona. Ann Dermatologie vénérologie. 2005;132(10):28–33. Beylot C, Bagot M, Cambazard F, et al. Infections à herpès virus de l'enfant et de l'adulte immunocompétents. La varicelle et le zona. Ann Dermatol Venereol. 2002;129:2S37‒2S43. Prise en charge des infections à VZV. Conférence de consensus de la Société de Pathologies Infectieuses de Langue Française. 25 mars 1998, Lyon; Med Mal Infect. 1998;28:1–8. Banejee A. Zona de l'enfant. Archive de Pédiatrie. 1998;5(2):199–203. © 2018 Yasmine. This is an open access article distributed under the terms of the Creative Commons Attribution License , which permits unrestricted use, distribution, and build upon your work non-commercially.